Don’t miss the video of Meteora at the end of this post! 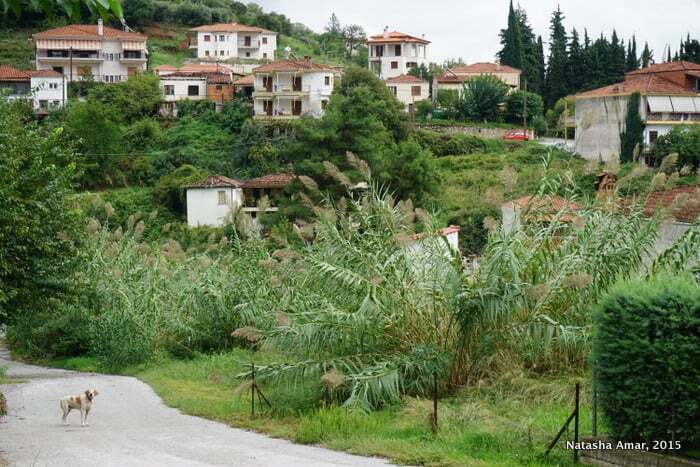 Five hours away from Athens is a landscape that seems right out of another planet. Here karsts rise out of a dense forest, their jagged peaks reaching out to the heavens. As the fog slowly moves to reveal red-roofed monasteries on cliff tops, you cannot help but wonder if there was a mythical giant that placed them there by hand like a couple of Lego blocks. 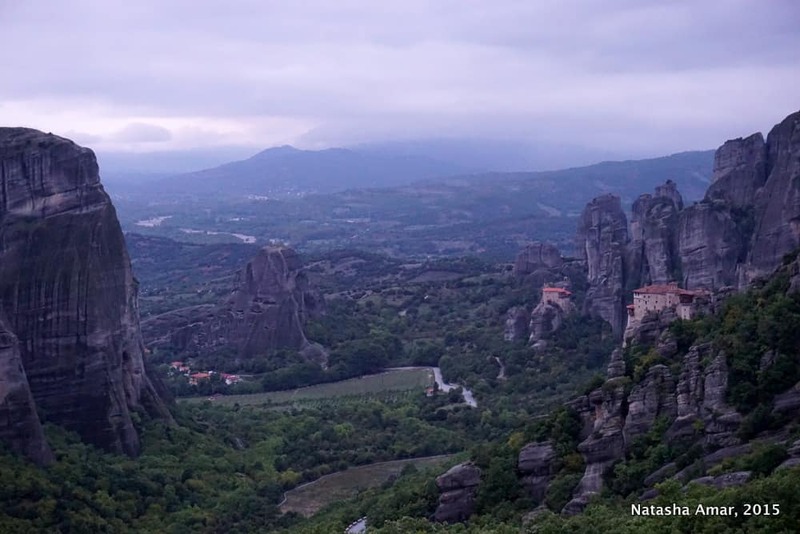 At least, that was my first thought when I saw a monastery in Meteora, a UNESCO World Heritage Site on the mainland in Greece, a country whose appeal is often overshadowed by its glamorous islands. I almost didn’t make it to Meteora, having missed my train from Athens by exactly one minute, so much that I’d seen the train leave right before my eyes. Luckily, a few minutes later, a bus was leaving for Kalambaka, the town at the base of the Meteora rocks which was to be my home for my two-day trip to the region. 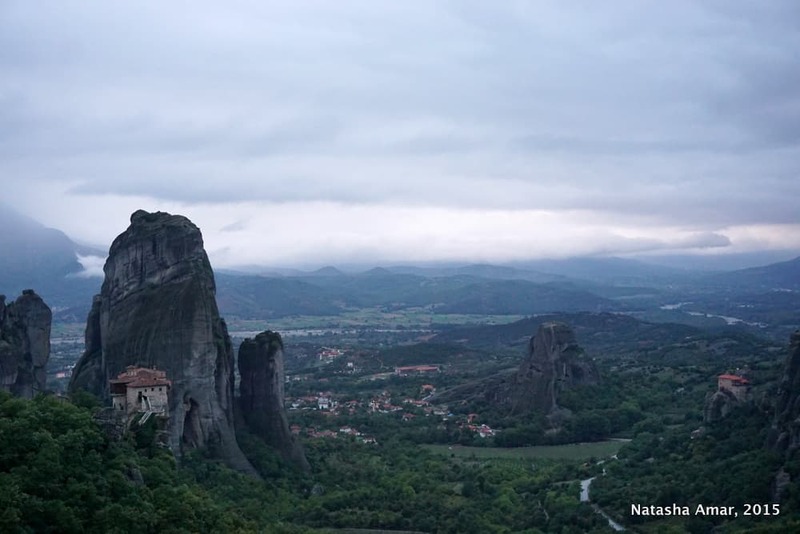 Meteora means ‘suspended in the air’ and it’s easy to see where this weather sculpted region shaped by millions of years of complex geological processes such as erosion, flash floods, and sedimentation, gets its name. 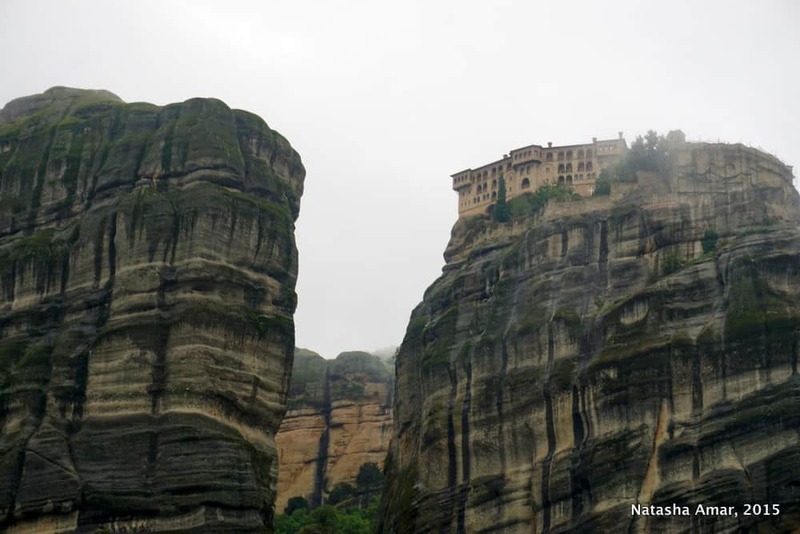 The fog that envelops the base of the rocks, once home to 24 Greek Orthodox monasteries of which only six remain, makes it seem like the structures are floating in air. 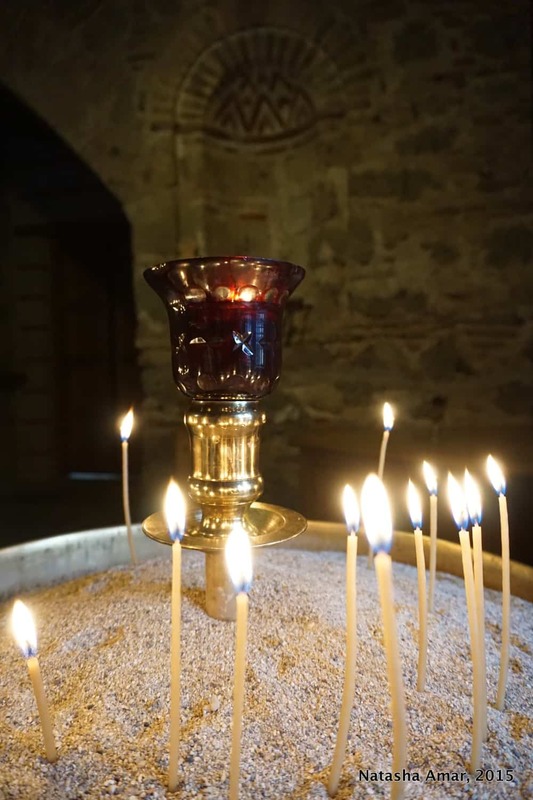 The first hermits to arrive in Meteora around the 9th-10th centuries came in search of a sanctuary that would allow them to disconnect from the rest of the world and focus on achieving oneness with God. 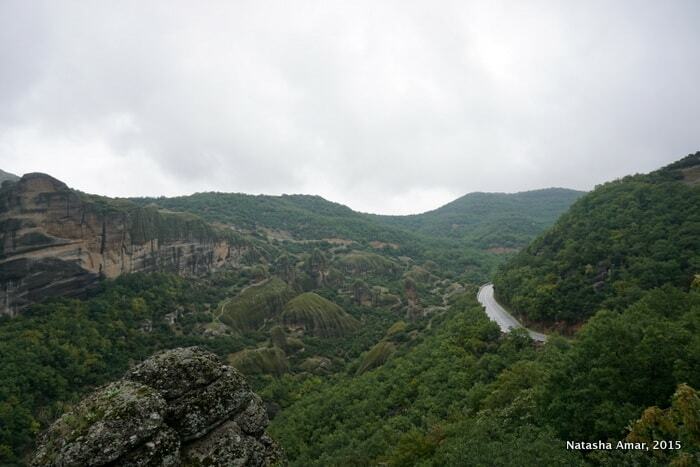 The isolated cliff tops, some over 600m high, were ideal. They scaled up the rock faces using ropes and took up residence in humble crevices and hollows, isolated even from each other and congregating only once a week for prayers. The only means of access was by ropes and later by wooden ladders. The first organized monasteries were set up in the 14th-century. Building the monasteries was no mean feat; it took 20-30 years to pile up the materials on the rocks and another 30 for the monks to build the monasteries themselves. Often a monk who had devoted his entire life to building a monastery would not see it completed in his lifetime. 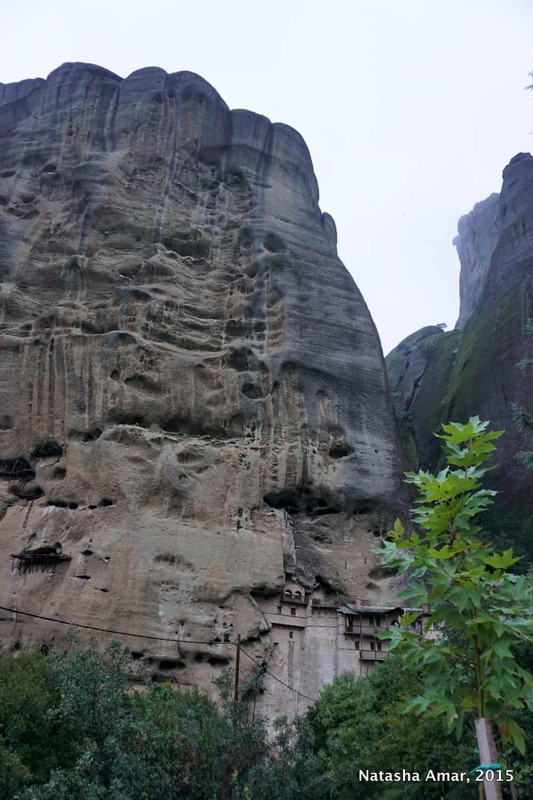 I explored the monasteries with Visit Meteora over a period of two days and got the chance to see the area on a Sunset Tour and a Half-Day Tour. 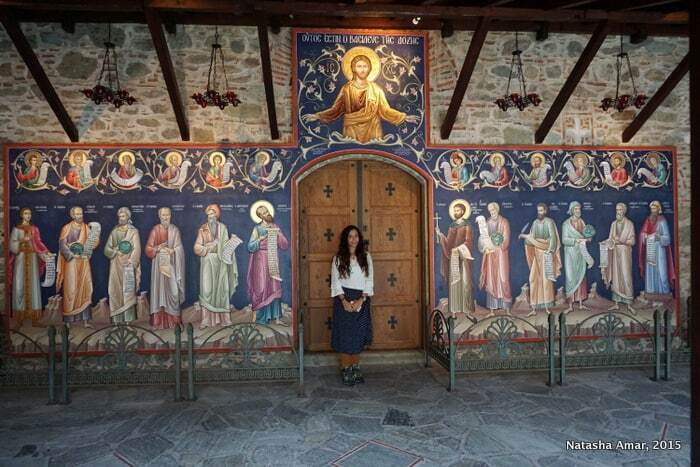 This was a great experience for two reasons- one, my visit wasn’t rushed and I was able to take the time to truly appreciate the beautiful frescoes inside the chapels. I often found myself completely entranced by the deep reds, gold and black paintings and I have to admit I’ve never seen anything like it ever. The other good thing was that I got to see the area at different times, and the views in the early morning fog, violet sunset, or bright afternoon sunshine, though all incredible, are vastly different. I also found some time to hike in the area on my own from an easy trail that led up to the rocks from my lovely guesthouse. If you plan on visiting the area, I suggest taking at least two days to tour Meteora, so as not to be totally exhausted or have a rushed visit. 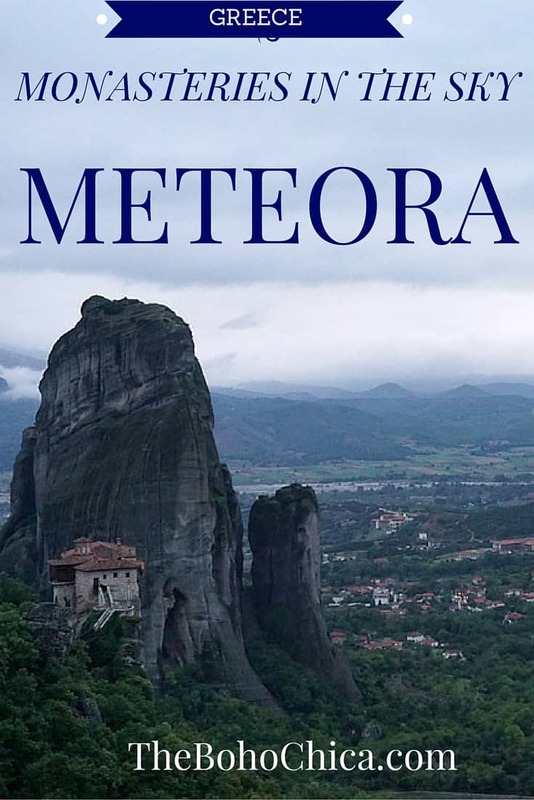 It’s ideal to join the tours organized by Visit Meteora- the information and stories of local legends are what make the visit a special experience. 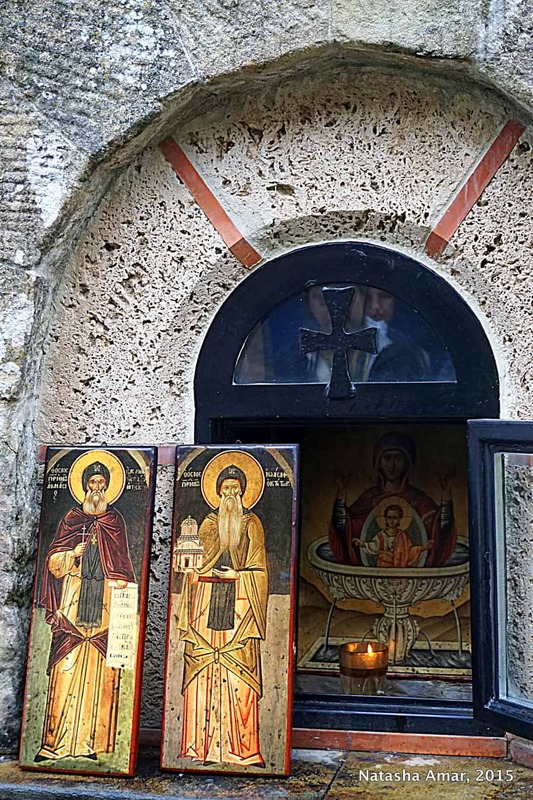 On my second day, I returned with Vaggelis, my guide, to visit the 14th century Holy Monastery of Great Meteoron, the oldest and most important of the monasteries in Meteora, built on the biggest rock in the area. After a few minutes up the long staircase, my lungs threatened to burst out of my chest. 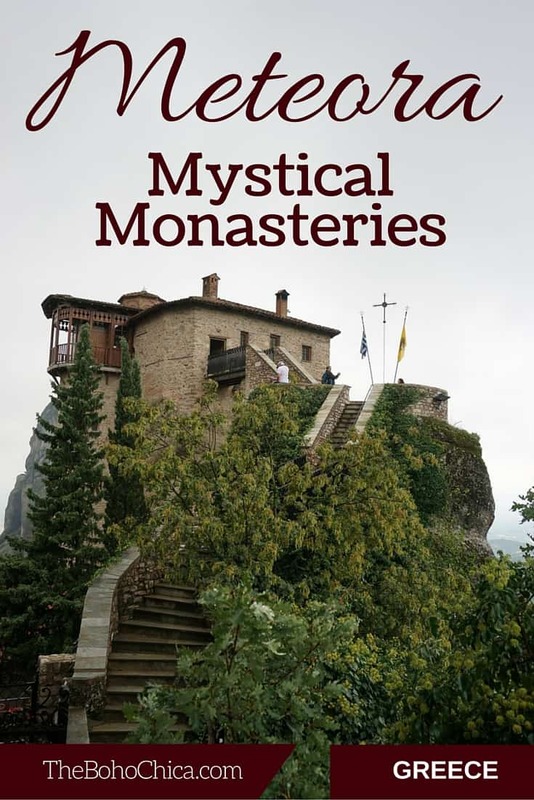 It was hard to imagine that staircases were built to reach the monasteries only in 1921. Before that, the monks would rock climb to the top using ropes and ladders. I distracted myself with the sweeping views of the forest below the gigantic rocks and pushed on. Inside, crowds wove in and out of the museum, refectory, carpenter’s shop and central courtyard. On display in the halls were Greek Byzantine art, religious icons, manuscripts and other artifacts. The chapels housed within their walls elaborate frescoes unlike I’d ever seen. I headed to the terrace and the view from the highest monastery in Meteora did not disappoint. The charcoal rocks, red-roofed monasteries and emerald forest played a spectacular game of hide-and-seek with the fog that hung low threatening to wash over the view. 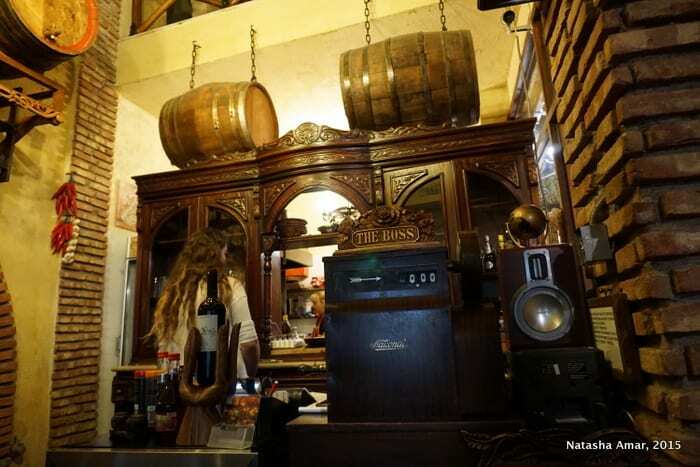 Very often, it’s the local legends and stories that breathe life into places that have a long history and luckily for us, Vaggelis had many a good story to share. Pointing to a line of scarves hanging on a high crevice, he narrated the story of the Muslim woman who offered her veil in prayer to St. George in the hope that he would save her sick, dying husband. 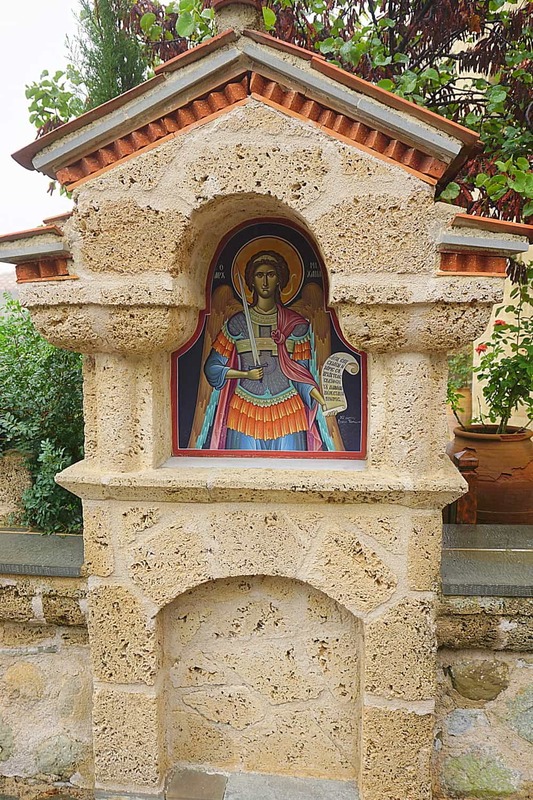 Her prayers were answered, and villagers, even today, in the belief that they are under the protection of St. George, climb up to the rock to offer scarves and have their wishes (often to find a beloved) fulfilled. The crevice looked anything but safe and I asked Vaggelis if any serious fatalities had occurred. “At least, I haven’t heard of any incidents,” he replied and I found myself admitting that in a landscape like this, it would hardly be surprising if some mystical forces were at play. The endurance of the surviving six monasteries, of which two were re-established by nuns after they were abandoned, has paid off. Today, these monasteries are completely self-sufficient, bringing in enough money from tourist entrance fees, donations and sales of souvenirs and other goods like honey. They’re able to extend financial assistance to the needy and provide scholarships. 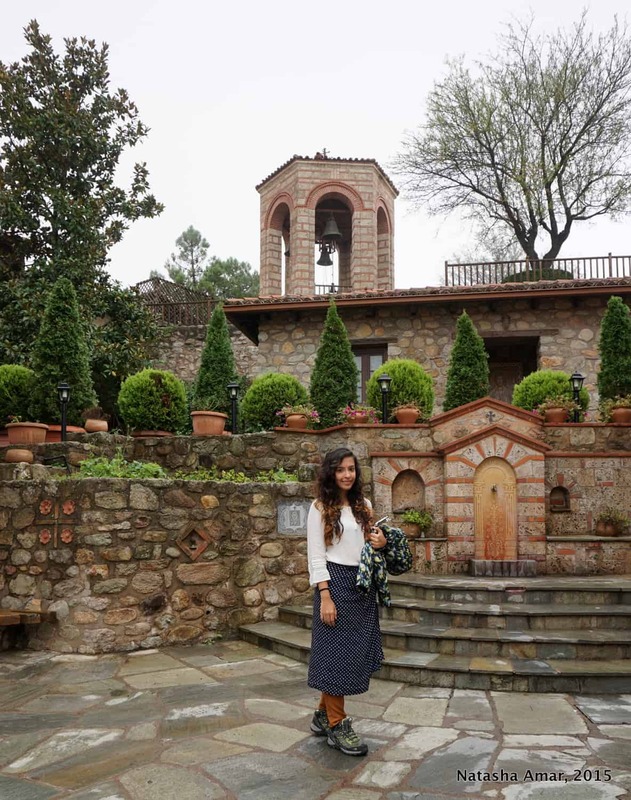 Visiting the monasteries of Meteora feels like stepping back in time by at least a few centuries. 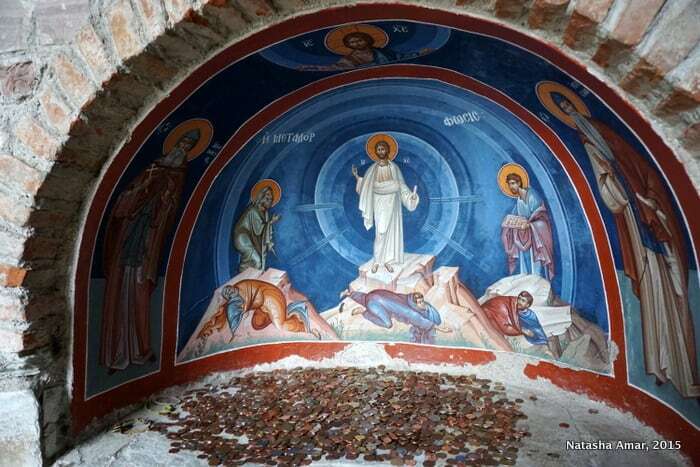 The frescoed walls of their chapels portray stories of the pain and suffering of the early Christians, and the dramatic landscape of karsts disappearing into the fog manages to retain the solitude that is deemed essential to spiritual awareness. Whether you’re interested in the cultural and spiritual aspect of the monasteries or the sublime beauty of the landscape, Meteora will both surprise and humble you beyond your expectations. Give yourself at least two days in the area. On my first day, the fog was quite heavy, and though it really added to the experience, visiting the monasteries on the second day with better views was something I would not have liked to miss. Wear comfortable walking shoes, carry a warm jacket as it can get quite chilly (and you’ll want to have your arms covered when visiting the monasteries) and a bottle of water. Join a group tour with Visit Meteora so you can get acquainted with the area, and can come back later to explore any sights you may find interesting. 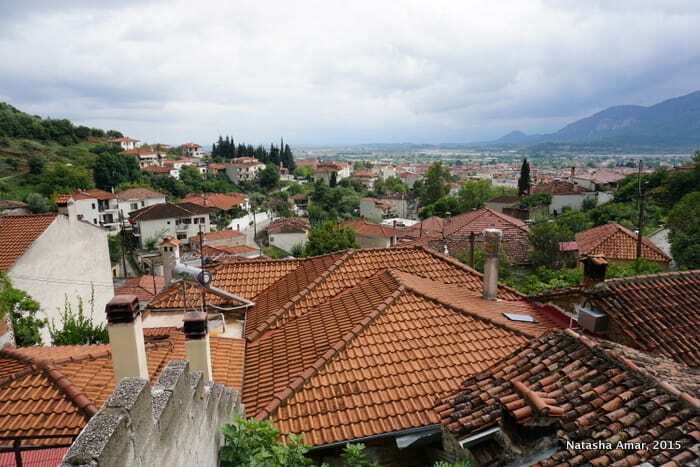 The town of Kalambaka is a good place to base yourself for easy access to Meteora (all the tours start here). 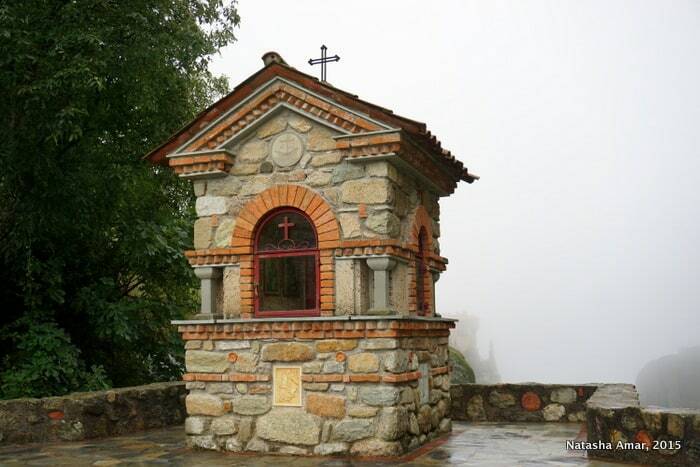 You can also walk to the Byzantine Church and hike to Meteora independently by an easy walking trail from town. 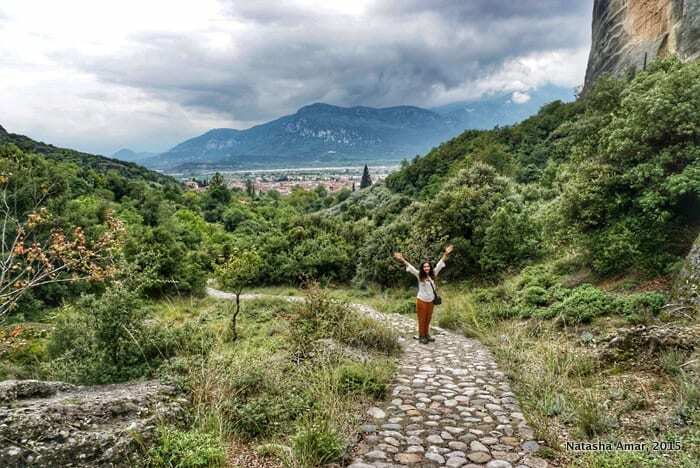 Stay at Alsos House, a family-run budget guesthouse at the base of the rocks, a ten-minute walk to the town center and five minutes to the start of the hiking trail. They offer a variety of rooms- from budget single rooms to nicer family rooms that are spacious and can comfortably fit a family of four. They also provide breakfast, something that may be hard to find elsewhere in the town. For a delicious traditional meal at an unbeatable price and the friendliest service in town, visit Paramithi Taverna. The owner is very warm and makes great recommendations. Don’t forget to try Revani, a traditional dessert that will leave you begging for more. Meal at Paramithi. (L-R Clockwise) Herbed bread, Dolmadakia (stuffed vine leaves), Revani and Mushrooms in white wine. For a mid-day snack or breakfast on-the-go, try the traditional pies at the big bakery in the town center. I ate as many as seven during my two days- that speaks to you not only about my gluttony but also about how amazing they were. 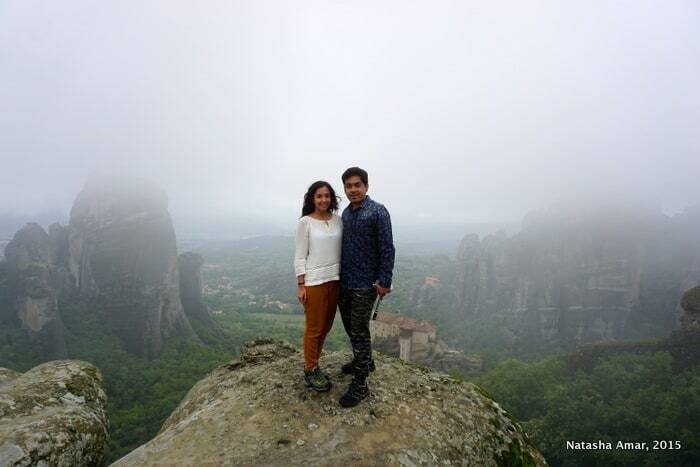 Disclaimer: My visit to Meteora was kindly arranged by Visit Meteora. As always, this post is an honest and independent reflection of my actual experiences. 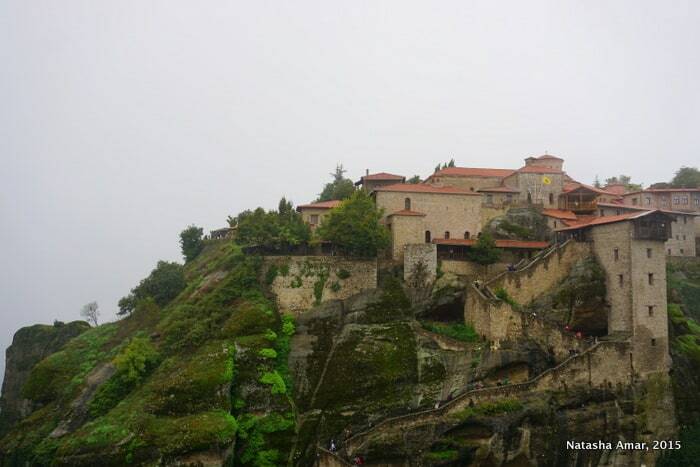 Have you been to Meteora or would you like to visit? I’d love to know in the comments below. If you like this post, please be a star and share it to Pinterest! For more posts from Greece, things to do in Mykonos or general travel information to help you plan your trip, please visit my Greece Travel Blog. Beautiful and very informative post. When we went to Greece, this was an area I had read about and really wanted to see, but our schedule just didn’t allow for it. At least now, I’ve seen some great photos, and your video, too! I hope you can go next time- it’s really something you have to see for yourself. Thank you for your great post. Meteora is on my wishlist. 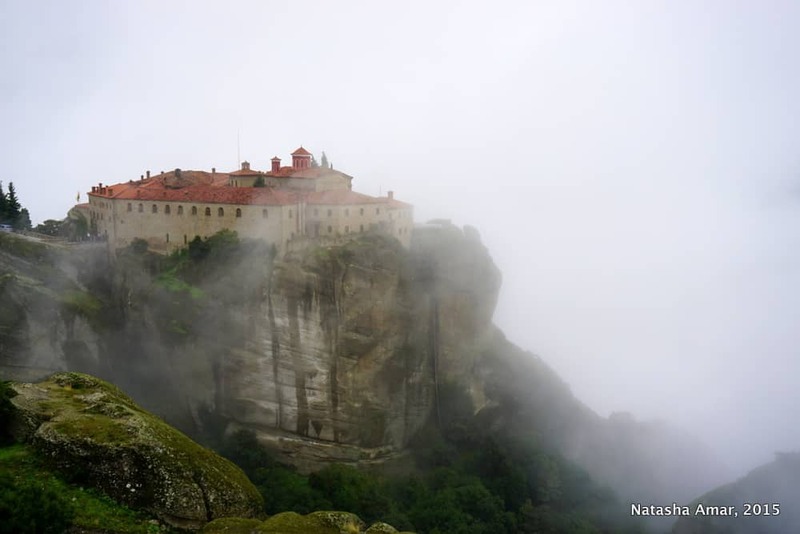 Wow, those pictures of the monasteries with the fog are just amazing! Sounds like the perfect place to spend a few days hiking and just enjoying the atmosphere. I also appreciated the food recommendations for Paramithi Taverna. I always appreciate a good place to stuff my face in. Haven’t been to Greece, but it’s one of those places I know I’ll get to eventually. Thanks for all the info and inspiration! Those views look amazing, plus the fog makes for it to completely surreal! 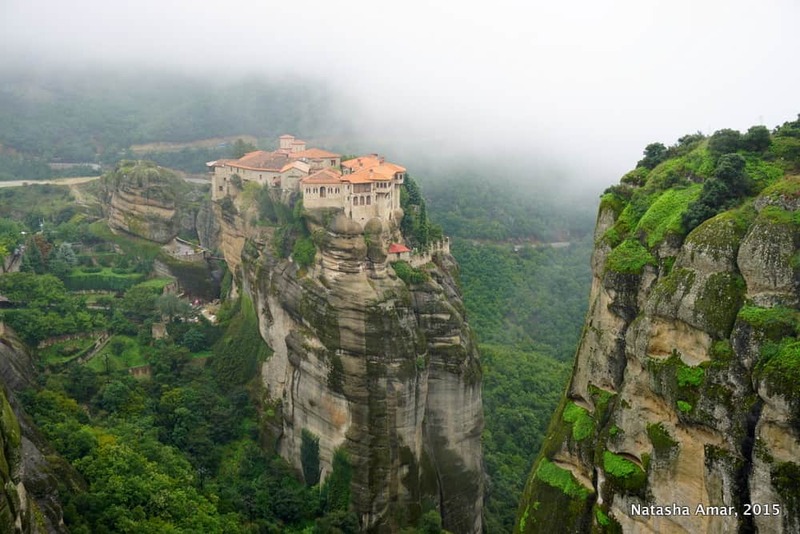 I’m a nture lover so I would definitely love to explore Meteora..
Those pics are simply breathtaking! This is the first time I am hearing about this place. Thanks for introducing me to this lovely new place. I love visiting such places less explored! Hope to make it some day! Wow, absolutely Breathtaking. I’m planning to hit Greece this summer and didn’t have this on the list, guess adding now thanks ;-). I think the biggest challenge I’m going to have there is climbing there, I hate climbing! But I gotta say the view is worth it. It looks beautiful. I can only imagine the hardship the monks had to go through when it didn’t have stairs. You can totally visit by cars and buses now Marge. And for those who don’t like climbing, there are other easily accessible monasteries. Phew! Quite a blog Natasha. Kudos! I was almost teleported to this mesmerizing place. Photos are fantastic and tips are really helpful. Keep inspiring us 🙂 ! Meteora is one of those places that are mind blowing! A mix of nature and human ability to build and live literally on the edge of the world! Loved you photos! 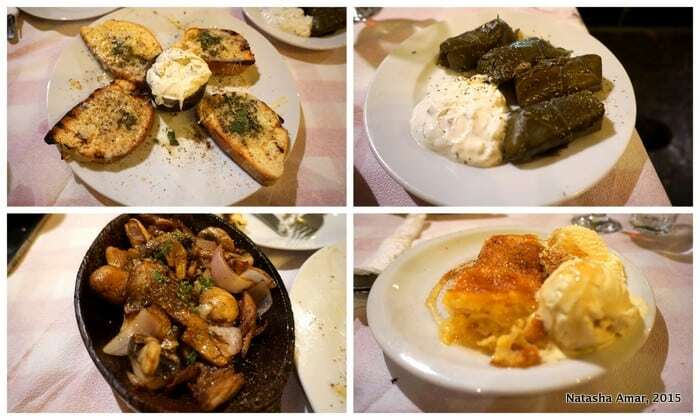 And you made me hungry talking about Dolmadakia, I LOVEEEEE greek food! 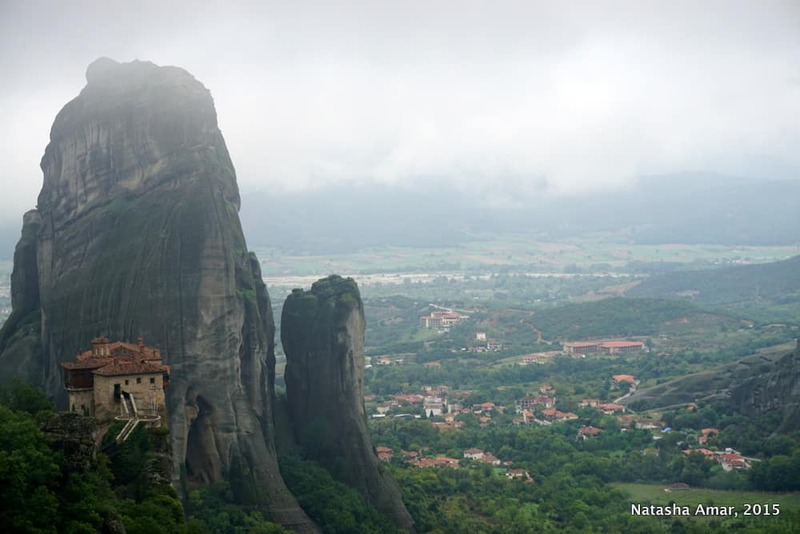 Planning our travel to Greece maybe end of next year and Meteora is on the list! This whole area looks amazing – I’ve been hearing quite a lot about Meteora this year, and I honestly can’t believe that it’s not more frequently visited. 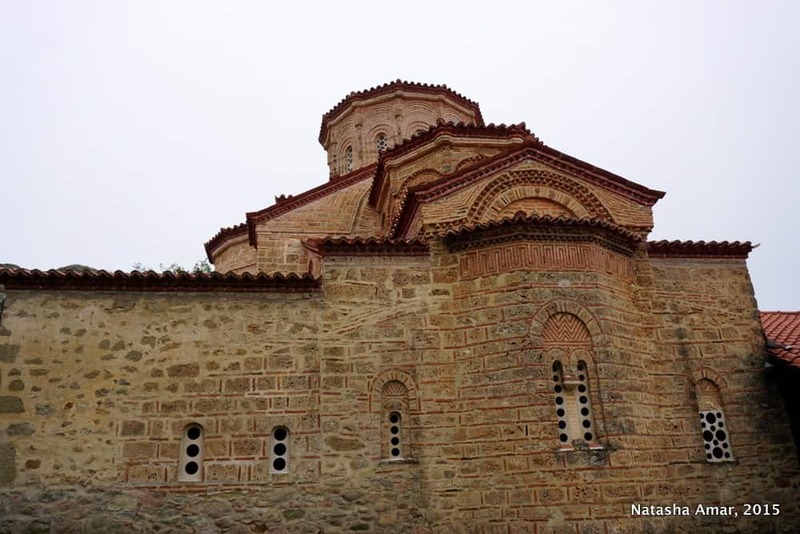 I guess everyone is so quick to associate Greece with island hopping and Athens that they overlook these stunning monasteries. Thanks for the tip on spending two days – it would be lovely to be able to experience the views in both the fog and with clear skies … most of the photos Ive seen have had a decent layer of fog which I think adds to the fairytale look! I do like the idea too of taking a tour when you first arrive to get your bearings and then use the rest of the trip to explore on your own. Thank you Megan. And you’re right, it is surprising that not more people visit Meteora. This is on our bucket list and it just looks amazing, we really need to get ourselves over there. I have always wondered if there was much rock climbing there too. There is rock climbing there and I can imagine climbers would love the area. I have hard of Meteora – this pace is legendary! Thanks for the tips for two days visit, I will keep it on mind when going there! Been there after TBEX Athens last year as well and LOVED IT! Great post and pics, they are only bringing me back memories of all the good moments I spent there. 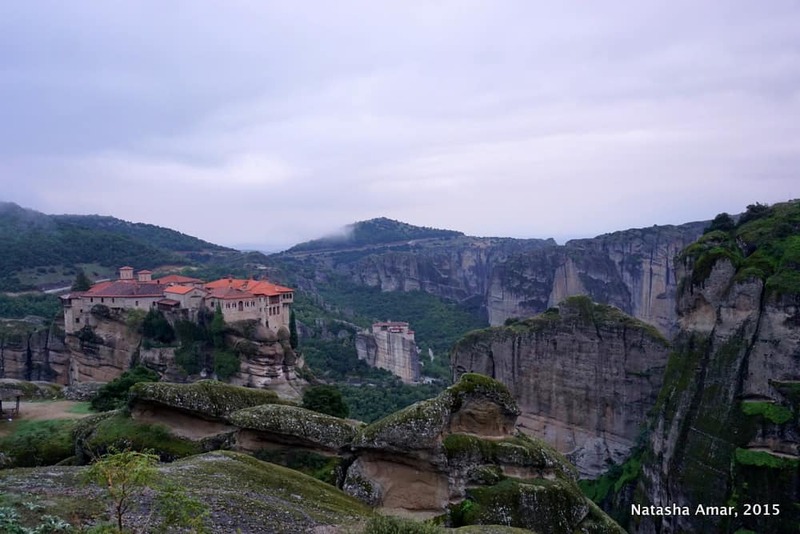 I’ve never heard of Meteora, but it looks beautiful! What an amazing place. Reminds me of photos of monasteries up in the Himalayas. It seems that ascetics from all religions seek out places to get closer to their god! 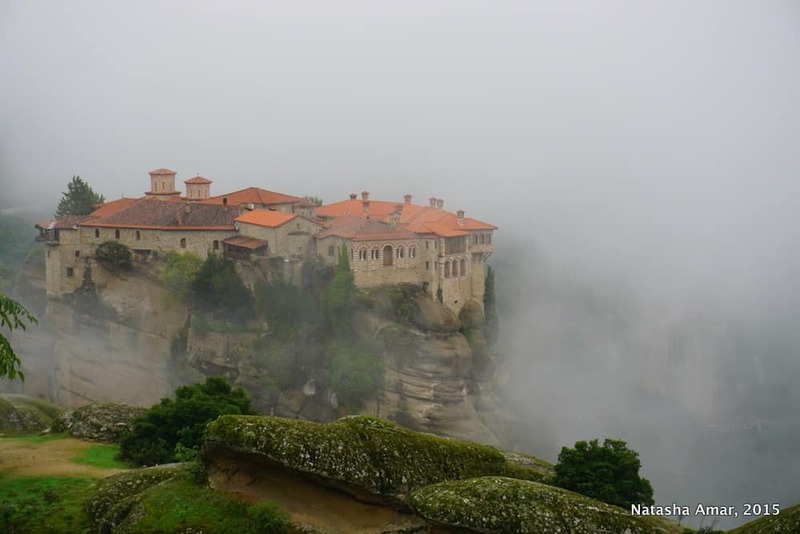 Meteora looks incredible – especially in the fog! What a special place! Your writing sucked me in from the beginning. I am entranced by both your writing and Meteora! Wow I have never heard of this place before, definitely adding it to my bucket list! I love your photos! 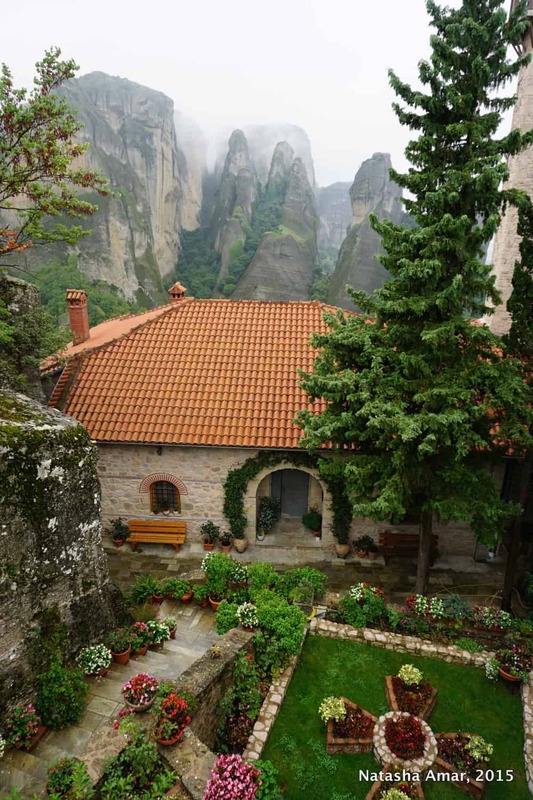 I have never heard of Meteora, but WOW it’s beautiful and sounds like a place I would love to visit. Beautiful photos and I think you are right, a few days would be great – I would love to see the foggy weather as well as clear weather, especially since your photos are so beautiful! I love that story about the veils – something you might not have learned if you didn’t have a good tour guide! This seems like an intriguing place. There are so many of them in Greece! Did you visit Spinalonga? You’d probably enjoy it if you liked Meteora. I haven’t visited Spinalonga, maybe on my next trip 🙂 and it’s true, having a good guide makes all the difference when it comes to visiting places with such a rich history. I have been to Greece 3 times and I am ashamed to admit that I haven’t made it to Meteora yet. This post convinced me even more that I should really go! You managed to get some fantastic views and a great overall experience. Good on you that you toured the area on a guided tour. I like the idea of getting as much information as possible! We have been to Athens, but not Meteora. What a gorgeous place! I cannot wait to explore the area. It looks unbelievable! Thanks for introducing me to Meteora. Now i know that besides the ruins and the beaches, there are these mystical monasteries high up in the clouds. I am glad 6 still remain! I hope you can visit soon Carol! I visited Meteora a few years ago and loved it! Thanks for sharing your post and those beautiful pictures! Excellent post. Looks like land from a fairytale. Wonder why this destination is not so popular. WOW this looks incredible. 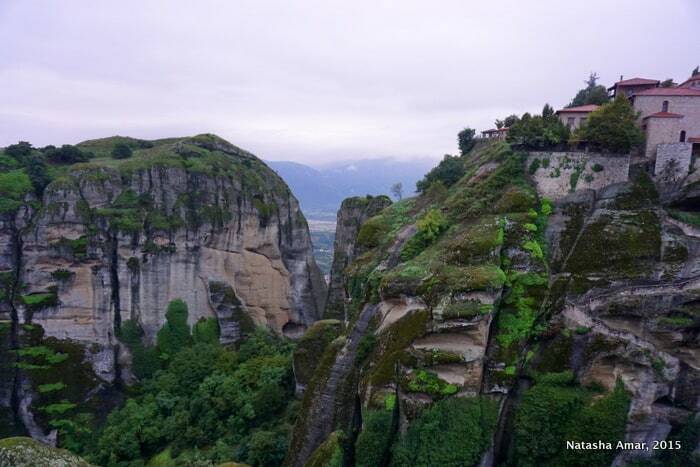 How is Meteora not at the top of every visitor’s list in Greece?? Good question! I knew it was on mine when I first saw a photo. I mean, yes, the islands are amazing but this is quite incredible too.